Have you ever been pregnant, or gained a few pounds in a short time frame? If so, you might be left with stretch marks. Stretch marks become visible on the skin when the middle layer of skin, called the dermis, tears when it is stretched extensively. Stretch marks show up mostly on the hands, hips, thighs, stomach area, breasts, underarms, and back. While often associated with women and pregnancy, stretch marks affect both men and women. When it happens, you are left with an unsightly scar on the skin. These marks might make you feel self-conscious, and even determine the type of clothing you wear. As a mother of two, I’ve looked for many solutions to heal the stretch marks pregnancy left me with. If you are dealing with stretch marks, you might feel like there is nothing you can do about them. Since they are created in the dermal layer of skin, they can’t be completely healed. Fortunately, there is an easy, affordable solution to improve the appearance of stretch marks. What is the magic ingredient? If you guessed coconut oil, you are right! The multiple benefits of coconut oil have been touted for many years. It is great to use for cooking, on your skin, and internally. Thanks to its healing, repairing, and moisturizing properties, coconut oil is an effective solution you can use to reduce the appearance of your stretch marks. In this article, we’ll let you know how to most effectively use coconut oil to treat stretch marks. As for what you’ll need, the list is pretty short! Why do we suggest coconut oil? For one, it has excellent antioxidant properties that help fight free radicals to gradually fade the appearance of stretch marks. Coconut oil contains vitamins E, K, and iron that stimulate new cell generation that helps the stretch marks fade. The Lauric acid content has antibacterial and antimicrobial properties that promote healing and fight bacteria. 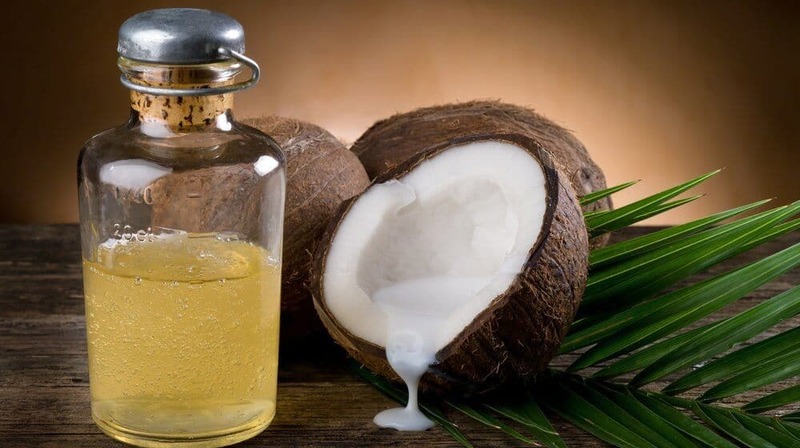 Additionally, the saturated fats in coconut oil help to make the skin’s cell walls stronger. Finally, coconut oil is an optimal hydrator that keeps your skin feeling soft and supple without leaving a greasy feeling. The best part about coconut oil is that it is easily available and affordable. In fact, you might have some in your cupboard at home already. If you don’t have any readily available, you might be overwhelmed by the selections at the store. As a general guideline, to get a high-quality product, look for coconut oil that is virgin, organic, processed in the least invasive way, and packaged in glass jars. Depending on the solution you try, you might need a few more ingredients. Tea Tree Oil: encourages healing with antiviral and antifungal benefits. Sugar: exfoliates dead surface cells to reveal healthy, smooth skin. Vanilla: adds a nice aroma to the coconut oil treatment. Lavender Essential Oil: treats irritated and damaged skin while delivering relaxing aromatics. Rose Essential Oil: opens up skin to help it absorb the nutrients from the coconut oil. Aloe Vera Gel: stimulates the growth of new cells while acting as an anti-inflammatory. Lime Essential Oil: delivers antioxidants to the skin. Lemon Essential Oil: exfoliates dead skin. Jojoba Oil: mimics the body’s natural oils to hydrate the skin in a healthy way. You may need the following pieces of equipment for your coconut oil solutions. The ideal time to apply coconut oil for stretch marks is after you bathe or shower. The warm water and steam opens up your pores, making them readily available to receive the healing properties of the coconut oil. Additionally, clean skin absorbs products better. Massage only the amount you need in a circular motion until it is absorbed. The simplest strategy just requires one ingredient: coconut oil. Take a dime-sized amount of coconut oil in your hand. Massage the oil into the affected area until it is completely absorbed. Apply the oil up to three times a day to gradually fade stretch marks. Gather your ingredients of coconut oil and tea tree oil. Measure four tablespoons of coconut oil. Add three to four drops of tea tree oil to the coconut oil. Apply the mixture directly to the stretch mark affected area. Use the mixture twice per day to remove stretch marks. Gather your ingredients of coconut oil, sugar, and vanilla oil. Add and stir in three drops of vanilla until everything is mixed well. Gently massage the coconut oil and sugar scrub onto your stretch marks for 15 minutes. Wash off the scrub with warm water.6. Use the scrub every day to reduce your stretch marks. For a spa-like treatment, follow these steps. Gather your ingredients of coconut oil, olive oil, aloe vera gel, lime essential oil, and lemon essential oil. Clean and prepare your equipment of a mixing bowl, an electric mixer, and an airtight jar. Add one cup of coconut oil, one tablespoon of olive oil, two tablespoons of aloe vera gel, 20 drops of lime essential oil, and 20 drops of lemon essential oil to the mixing bowl. Beat the ingredients with the electric mixer for five to seven minutes until it light and fluffy, similar to the texture of whipped cream. Transfer the mixture to an airtight jar and seal it. Cool the jar in the fridge. Apply the cream to your stretch marks two times a day to reduce the appearance of your stretch marks. Gather the necessary ingredients of shea butter, jojoba oil, coconut oil, and lavender essential oil. Clean and prepare the equipment of a double boiler, a glass bowl, and an airtight glass jar. Add ½ cup of shea butter, ¼ cup of jojoba oil, and ¼ cup of coconut oil into a glass bowl. Mix the ingredients well, and place the glass bowl with the ingredients on the double boiler. Heat the double boiler to medium high heat. Stir the oils and shea butter together until they are fully incorporated and melted. The blend will be semi-clear. Cool the mixture in the refrigerator for one hour, or until solid. Remove the blend from the fridge and beat with a hand mixer until it resembles whipped cream. Add five to ten drops of the lavender essential oil. Beat again until the essential oil is mixed in well. Transfer the blend to the glass container and refrigerate for another hour. Apply the healing coconut oil butter everyday to improve your stretch marks. Measure one cup of coconut oil into a saucepan. Heat the oil over low heat. Add ten drops of rose essential oil to the coconut oil. Mix the oils together gently with a spoon. Remove the oils from heat and let stand for 45 minutes. Transfer the oils into an airtight glass jar. Take a small amount from the jar and gently massage into your stretch marks for ten minutes. Repeat daily to effectively fade your stretch marks. In a microwavable container, warm one cup of coconut oil until it is softened but not melted. Stir in one cup of cane sugar just until it is incorporated. Leave the mixture at room temperature so it maintains a soft consistency. Massage the scrub into your stretch marks daily for 20 minutes to fade stretch marks. If you have struggled with finding a solution to get rid of your stretch marks, we hope that these solutions and instructions have been helpful for you. After using coconut oil for the stretch marks pregnancy left me with, I can attest to the healing powers of these solutions, and after daily use, you can also see the gradual improvement of your stretch marks. Let us know what you thought of the tutorial in the comments, or any other coconut oil solutions you’ve had success with. Know someone who could benefit from this information? Be sure to share the article to spread the word.